Sinovuyo means "We have happiness" in isiXhosa, the predominant language in the Eastern Cape. Studies to develop and evaluate a free evidence-based parenting and teen programme, with 10-17 year-olds, to reduce violence inside and outside the home in rural and peri-urban areas of South Africa. This research is a collaborative effort between the South African Departments of Social Development and Basic Education, UNICEF, the World Health Organisation, and the Universities of Cape Town and Oxford. The Sinovuyo Teen Study is part of the World Health Organisation's Parenting for Lifelong Health (PLH), a suite of parenting programmes to reduce violence. Child abuse rates are high in Sub-Saharan Africa and are exacerbated by family-level stressors such as poverty and HIV/AIDS. Adolescence is a particularly high-risk stage for abuse, with rates of violence victimisation increasing not only within the home, but also in community settings. Yet, to date, there are very few evaluated evidence-based child abuse prevention interventions for children in Sub-Saharan Africa, and no known parenting interventions designed specifically for the needs of AIDS-affected children in the region. Secondary objectives include to: increase good parenting practices; increase social support; improve mental health, and; improve family capacity to plan for keeping adolescents safer in the community. The Sinovuyo Teen Study research site is located in the areas around King William's Town in the Amatole District Municipality of the Eastern Cape in South Africa. Following on from positive results from two pilot pre-post studies (in 2013 and 2014), the team conducted an even larger evaluation of the programme. The evaluation, a cluster Randomised Controlled Trial (cRCT), was conducted with 552 families (1100 participants) across 40 villages. Baseline 1 and Baseline 2 questionnaires was completed in September 2015, and the parenting intervention, which was facilitated by our implementation partners Clowns Without Borders South Africa, was completed in November 2015. A mini-post test data collection was completed in November and December 2015. The team also completed a 6-month post-intervention follow-up in the summer of 2016. All of the studies involved conducting baseline and follow-up interviews with caregivers and their teens, before and after the Sinovuyo Teen programme in order to test its effectiveness. This was done by local research assistants who were trained to use electronic tablets with validated screening tools to collect qualitative and quantitative data. The resulting data were then anonymised and examined using statistical analysis. The implementation component of the Sinovuyo Teen programme consisted of 13-15 weekly group sessions, which were attended by caregivers and their teenagers. The programme is based on evidence-based parenting principles, which have shown to be effective, such as: increasing praise and responses to behaviour problems, home practice, illustrated stories using picture codes, traditional stories, role-play, modelling, interactive exercises, stress reduction, and group problem solving. Note: Given the sensitive nature of themes under discussion, the baseline survey for the teens and the caregivers are undertaken in two parts. Part I of the questionnaire consists of relatively anodyne questions which helps establish trust and mutual comfort between the respondents and the research assistants. This is followed up with Part II of the questionnaire where we broach more difficult topics related to abuse experience, and sexual reproductive health. During the course of interviews, often our participants disclose distressing information about themselves or their families to our research assistants. Often, we find ourselves legally and morally obligated to help these participants who may otherwise be in imminent danger. When we help a participant or a family, we call it a 'referral case'. Despite the desire to help our informants, our team often faces resource constraints, logistical difficulties, and needs to be mindful of socio-culturally sensitive issues in the community. Based on our experiences, we have developed guidelines for dealing with referral cases and proving follow-up support. The original manuals have been adapted for implementation for young children, adolescents and HIV-prevalent contexts. 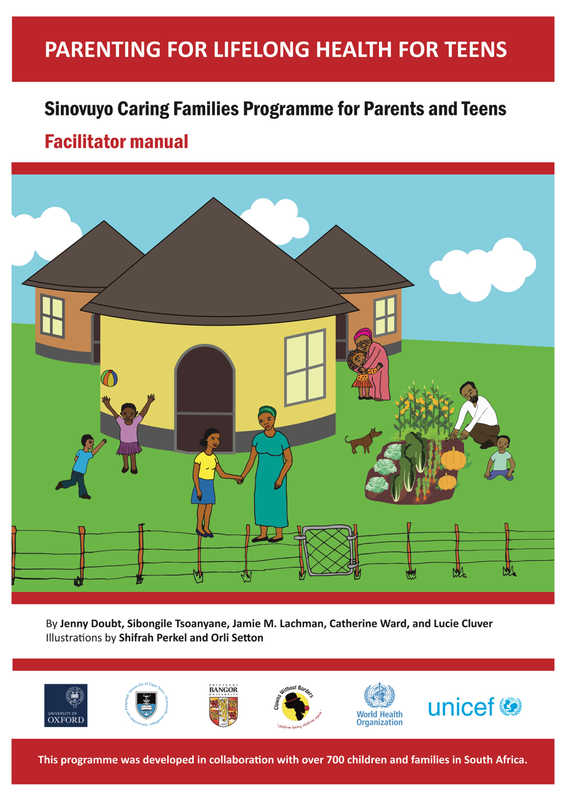 To support contextually-relevant implementation and scale-up of Parenting for Lifelong Health, these manuals are also being adapted and translated for implementation in Sotho, Swahili and Creole. Manuals are also available in Xhosa, Tagalog, SeSotho, Kiswahili, Luganda, Afrikaans, French and Arabic. For more outcomes see our latest policy brief, Parenting for Lifelong Health: Supporting Families in Low-Resource Settings. In 2018, Randomised Controlled Trial results were published in BMJ Global Health. Countries planning and implementing Sinovuyo Teen scale-up. Results from the studies of Sinovuyo Teen (also known as PLH for Teens) sparked major interest from international agencies and governments to plan scale-up. This resulted in the adaptation of 8 manuals that are being implemented across 11 countries in Africa. This programme is currently being delivered to around 250,000-300,000 families across the continent. Eight manuals including a suite of five original Parenting for Lifelong Health facilitator manuals and family guidebooks that are freely available online. Dr. Catherine Ward, Professor of Psychology in the Department of Psychology at the University of Cape Town.